Let's get on with myth-debunking. In the second post I gathered all misconceptions surrounding the Imperium of Man. It suffers from the excessive grimdark treatment more than any other faction: a lot of sources give a one-sided picture of wars Imperium wages and conditions, in which most of its subjects live their day-to-day lives. Another problem is that a lot of times the lack of writers' imagination leads to Imperium loosing its most important feature - infinite variability of 40k-era worlds and societies. So let's have a look at the most common mistakes. Lore: Imperium is often considered to be a rigidly controlled solid state. In practice, it is more accurately described as a loosely organised coalition of planets, control over each of whose can be very feeble. There is no unified currency, most laws have no power on any planet except the one they were written on, and each planetary governor, for the most part, may rule as he sees fit. As a result, for every standard imperial world there are several bizarre and strange ones, and infinite variety of imperial planets can be only compared to Imperium's lack of control over the majority of them. 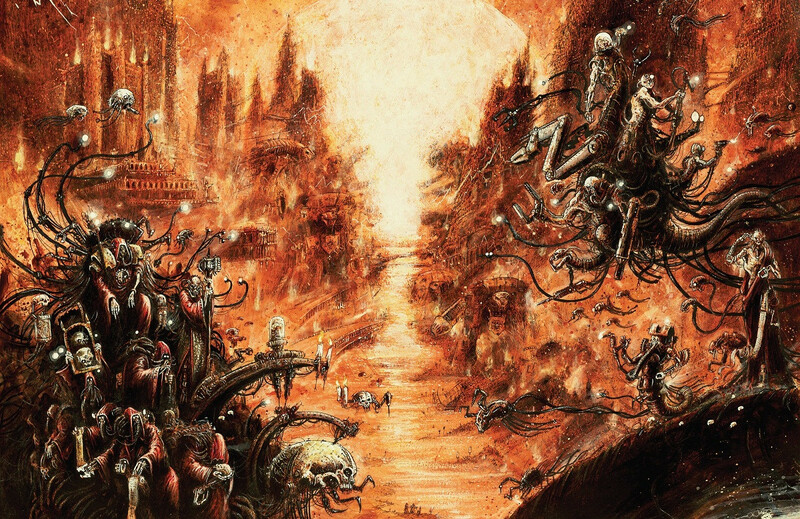 Most of any given planet's matters remain its own and as long as the tithe is paid, psykers are handed over to the black ships, the Guard recruits are drafted and no violations of few basic prohibitions are made, planets may not be all that dependant from Terra. In the end, for some far-flung worlds inclusion in the Imperium ends up being little more than a formality. Lore: Imperial worlds can be found in most corners of the galaxy, but between many "neighbouring" imperial star systems, you can often find a small Ork empire, a couple of renegade-held systems and a million of uninhabited ones. 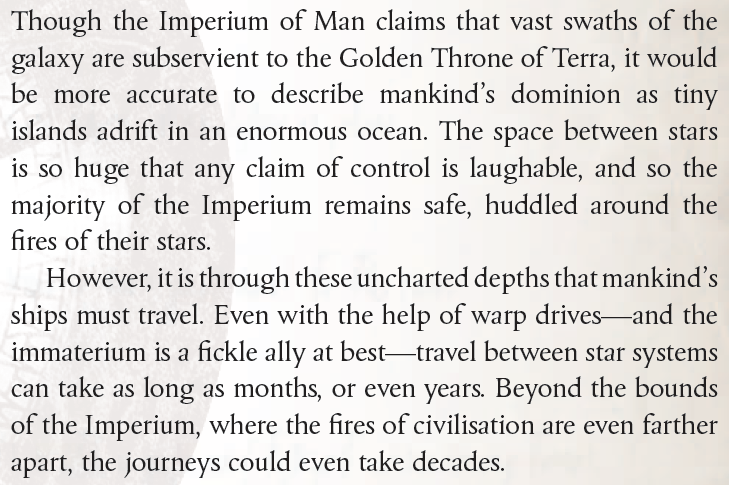 In other words, the Imperium is more alike to a net of star systems, lost in an endless black void and connected only by thin threads of warp-shipping and astropatic communication. Lore: With the exception of certain planets under the dominion of a certain branch of Adeptus, such as cardinal worlds or forge worlds, their presence varies enormously from planet to planet. On capital worlds it is indeed very high, while on the frontier planets it's often negligible. Feral, feudal, knight and a greater part of civilised worlds don't have much in common with a typical view of the imperial world, and the roles, traditionally associated with a certain branch of the Adeptus are taken over by completely different local organisations, be it tribal councils, guilds or anything imaginable. Lore: Imperium can and does colonise new planets, even in M41. However, it is usually much more practical to conquer planets already suitable for life and inhabited by renegades or хenos races then terraform new ones. That turns colonisations into military campaigns like Sabbath Worlds Crusade and Achilus Crusade. It should also be noted that from the 750.M41 the Time of Ending begins, and Imperium generally loses more planets than it manages to conquer. 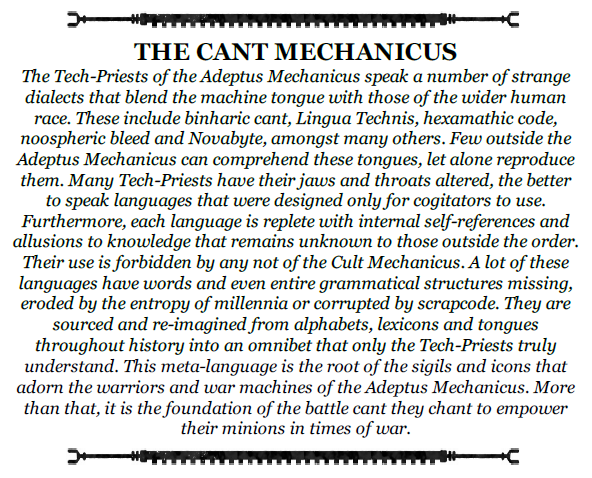 Lore: Mechanicus is an organisation that possesses power and independence incomparable to any other Adeptus, with a possible exception of Inquisition. It is hard to overstate the influence of the Machine God's followers: their network of forge worlds and dependant knight worlds and research stations essentially forms a shadow empire of their own. Within it exist a lot of substitutes for other imperial organisations like Inquisition, Ministorum, Arbites, Astra Militarum, PDF and Navy. No other Adeptus holds real power in this hidden domain, and that makes Omnissiah's realm a separate world, divided from the rest of the Imperium in many ways. Lore: Many relics from the Dark Age of Technology are very complex in construction, and many of them are not really understood in M41. 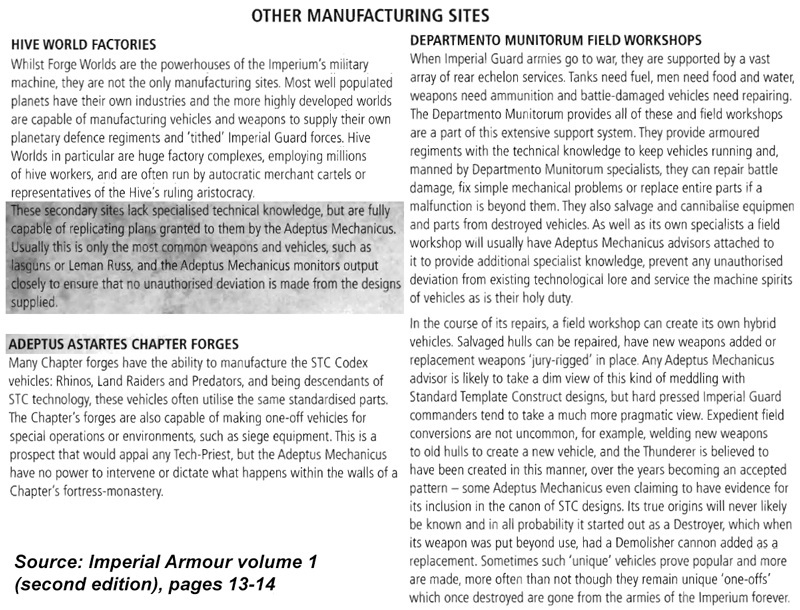 But most of the imperial tech is well known, mass-produced, modified and repaired all over the Imperium. Furthermore, Mechanicus occasionally do create new tech on the base of old one, as well as introducing new unique patterns and modifications. It should be noted that Imperium does exist in the state of technological stagnation, but it is not due to the lack of innovation, but due to the way tech-priests value knowledge they possess, which generates the atmosphere of total secrecy, in which those innovations are jealously guarded from the curious eyes and rarely enter the stage of mass-production. Lore: Mechanicus produce the majority of the most complex (and often secret) tech in the Imperium and the tending of these valuable machines is the duty of techpriest engineseers. But most of the repair- and even production-related work is done by simple technicians, who learned all the needed skills and litanies and call on engineseers' help only in rare and most difficult cases. Many machines are mass-produced on hive worlds like Armageddon by powerful corporations, that got the rights needed to produce tech using some of the Mechanicus' sanctioned blueprints. Lore: Collegia Titanica consists of four branches, of which Divisio Telepathica and Divisio Investigatus don't have any engines at all. Divisio Mandati holds all Imperator-class Titans while legions of Divisio Militaris harbour all other types. But even those also feature their own space fleets, ground infantry and vehicle forces and all the support units needed to reassemble, repair and power these mighty engines of war. All of these fall within a Legio organisation and are independent from the larger Mechanicus hierarchy. In a lot of ways this makes a Titan Legios a Mechanicus' counterpart of Imperium's Space Marines. Lore: Astra Militarum regiments are a relatively unified military force, that fights under centralised command structure and is constantly redeployed from one battle zone to another. Constant wars against mankind's worst enemies lead to a high rate of attrition and make guard regiments a well-prepared and experienced force designated for the hard tasks of besieging non-imperial worlds, launching crusades in the void and defending fortress worlds and other planets under the constant threat of an invasion. 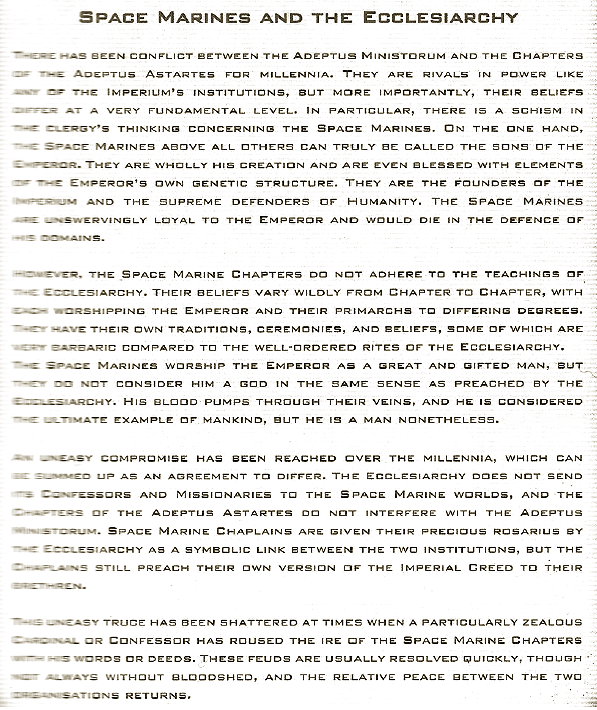 Lore: No law or decree requires any Space Marine chapter to follow any of Codex Astartes' requirements. 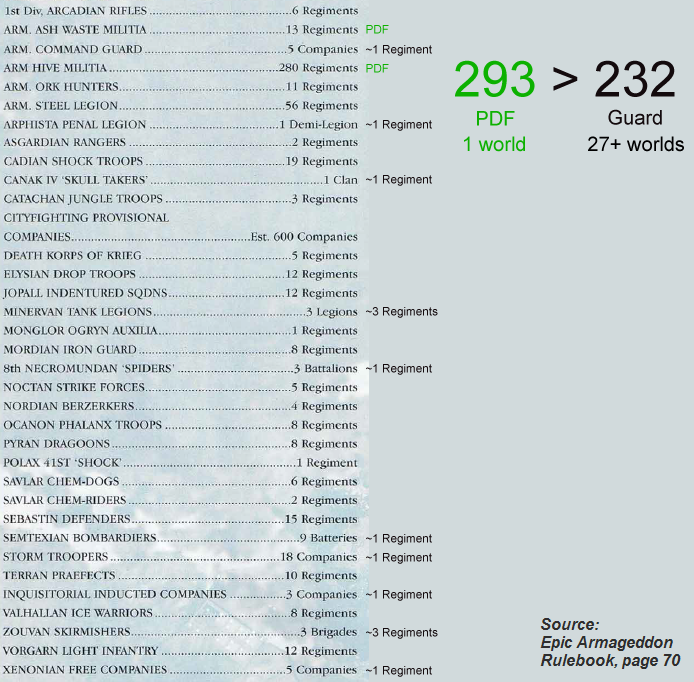 Historically, Lords of Terra supported the spread of codex-adherent chapters by founding most chapters from Ultramarines' geneseed. But, while most chapters respect a lot of Codex tenets, most don't follow the book word for word. Even among the chapters of the first founding only Imperial Fists, Raven Guard and Ultramarines meet the codex organisation requirements, while all others step away from them in one way or another. The situation is similar with later foundings with chapters like Flesh Tearers, Sons of Medusa and Black Templars virtually ignoring large parts of the Codex. 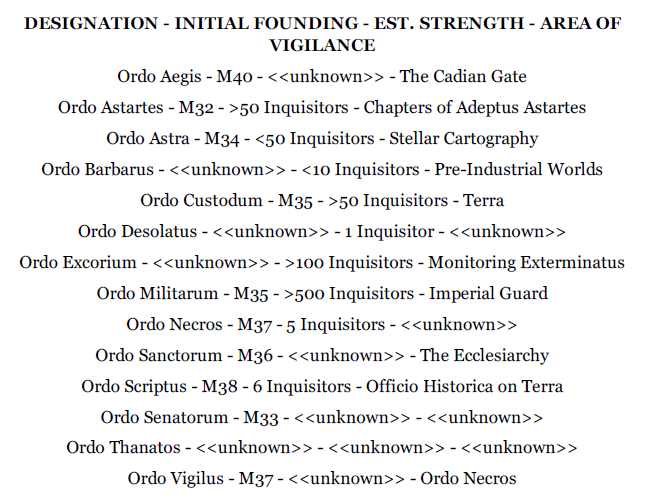 Most of the organisation principles were actually passed down to Astartes chapters from the Legions of old, and that's where a lot of teachings of the codex came from. Much more important part of Guilliman reforms are the division of Legions to Chapters and Imperial Army to Guard and Navy. Lore: Contrary to the Legions of old, Space Marine chapters have much less manpower and they are ill suited for capturing and holding large swathes of territory. Astartes strike forces are deployed with specific missions like capture and destruction of vital enemy facilities or leaders with a subsequent extraction without engaging in long positional conflicts, which they have no chance to win due to their lack of manpower. 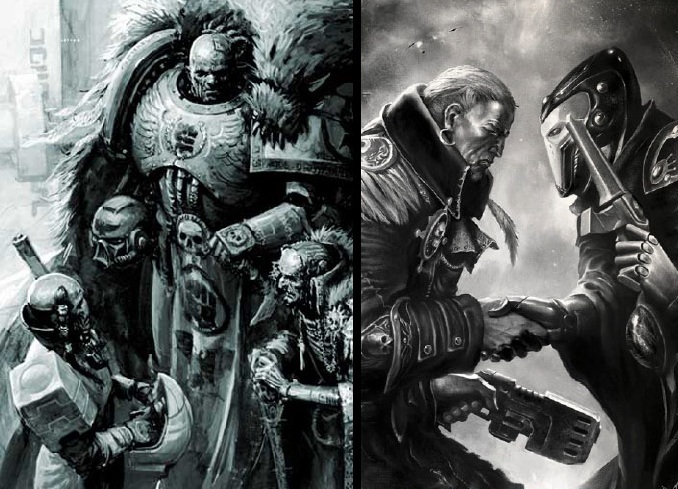 Lore: Space Marine chapters have their origins in ancient times, when the Emperor still walked among his men. As a result, their beliefs are much closer to the Imperial Truths of old then to the Imperial Creed since the latter was spread by the Ecclesiarchy long after the Emperor was bound to the Golden Throne. Because of it, in most Astartes chapters the Emperor is not not considered to be a god and, instead, various unique beliefs are practiced, ones that often contradict teachings of the Adeptus Ministorum. However, this rule also has exceptions with chapters like black Templars worshipping the Emperor more or less similarly to most of the Imperium. 1. Emperor is the only god and have always been the only god. 2. He has a plan for every human being and the imperial Adeptus work to make it a reality. 3. Chaos forces, mutants and xenos races are the enemies of humanity. As long as the particular branch accepts these three principles, it may take any possible form and still be a part of the Creed. On a particular argi-world the Emperor may be worshipped as a sun god that rises every morning to grant the life-giving light to his subjects, while on a neighbour planet he is thought of as a dark god of death that commands all mortals to live and die by his commands. These beliefs often contradict each other, but they are all a part of a complicated system that is an Imperial Creed. Lore: Adepta Sorroritas is an Ecclisiarchy subfaction that consists of Orders Hospitalier, Orders Dialogus, Orders Famulous and Orders Militant. 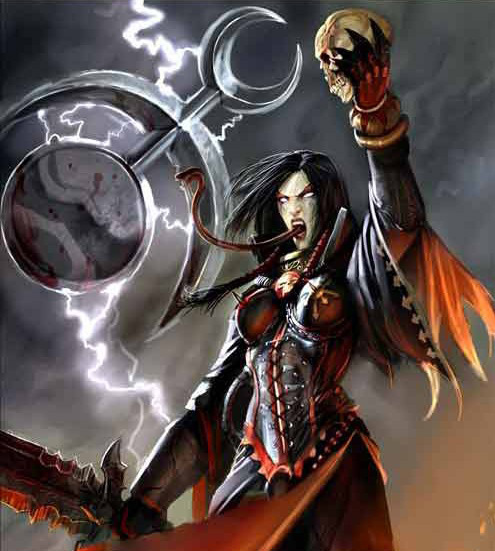 Only the latter are used as military wing of the Ministorum and therefore informally known as Sisters of Battle. 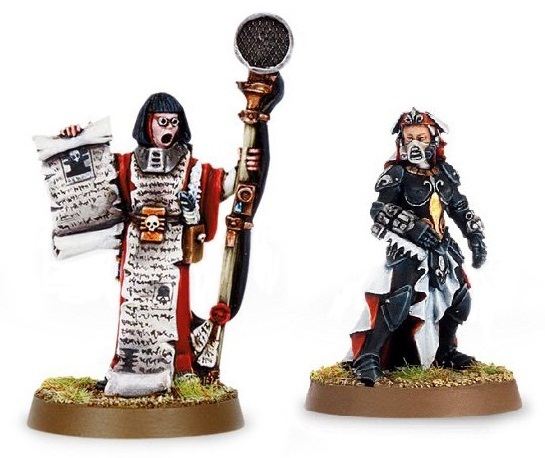 For example, two ladies pictured below are both members of Adepta Sorroritas, but neither can be called a Sister of Battle. Another misconception, stating that all females from Schola Progenium end up as Sorroritas in also unjustified. Only a select few are pious enough to deserve this honour and most end up in Commissariat or other Adeptus. 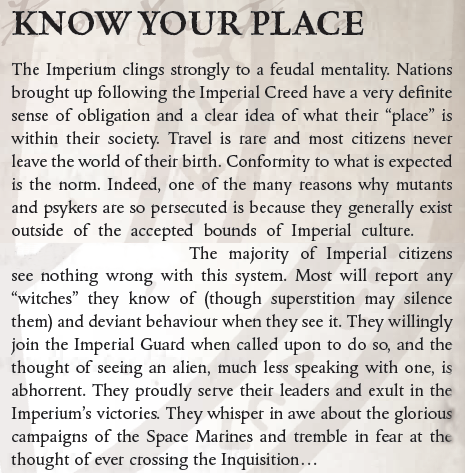 Lore: Imquisiton is a little more than a bunch of inquisitors with their acolytes, that are formally organised into Ordoses as well as temporary covens and conclaves. However, each inquisitor is a completely independent authority of his own and has his or her own sphere of influence and methods. As a result, disagreements and conflicts within the inquisition itself are very common. Adherence to a various ideologies makes the situation even more intricate and divides this organisation even further. 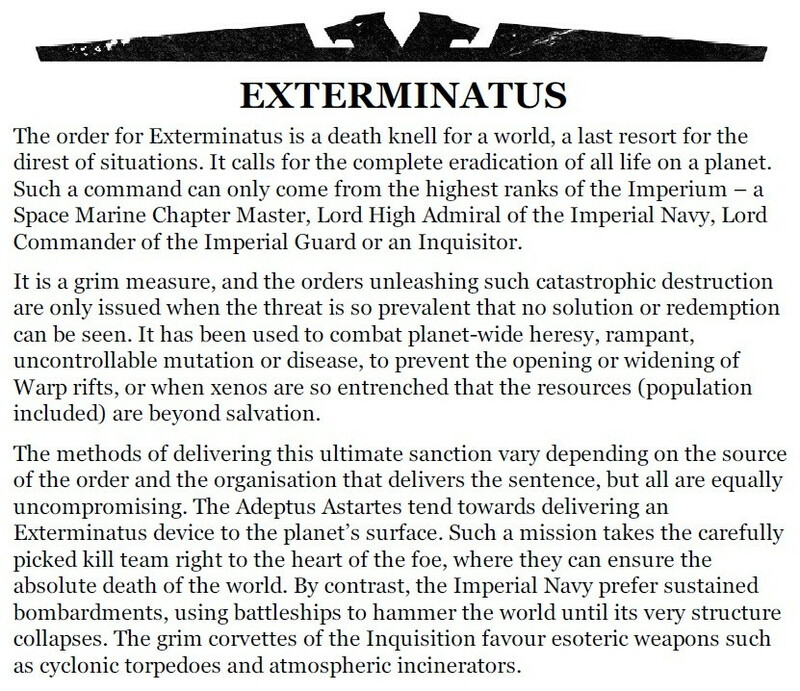 Lore: Only the most powerful imperial Adeptus are authorised to such a radical measure as a destruction of planet's biosphere - a process known as Exterminatus. In addition to the Inquisition those include Astartes and Mechanicus, as well as the most senior ranks in the Fleet and Guard. Exterminatus can be achieved in a lot of various ways: from exotic virus bombs to the straightforward sustained bombardment of the weaker regions of the planetary core by fleet weapons. 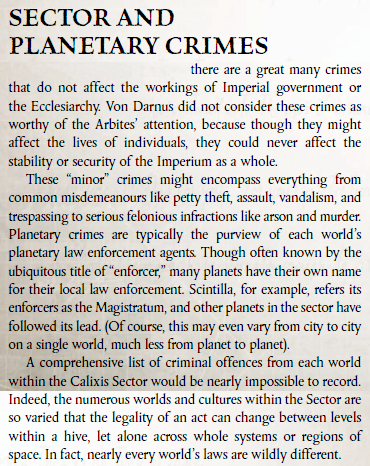 It should also be noted that each world is a considered to be a priceless possession of the Emperor himself, and its destruction should be justified in the eyes of the High Lords of Terra, so the Exterminatus happens very rarely indeed. Fate of individuals like Kryptman and Jaq Draco serves as a good example of what happens to Inquisitors who misuse the power they are entrusted with. 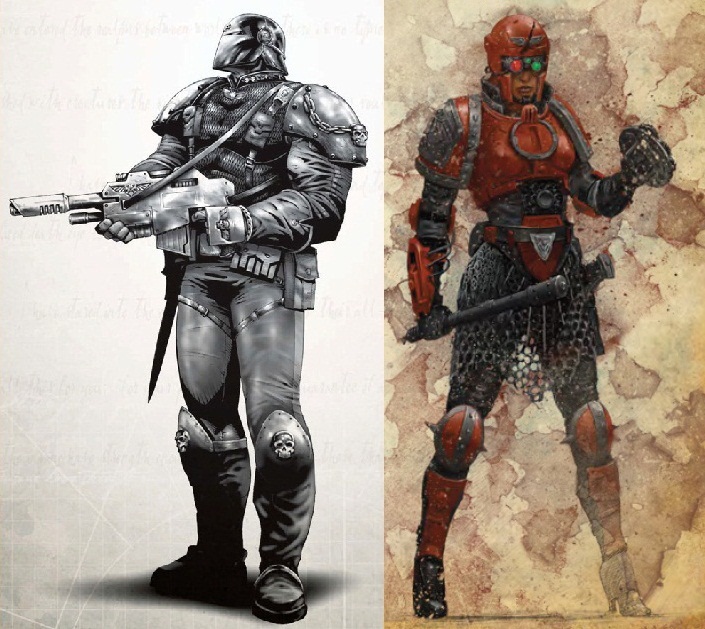 Lore: People in the Imperium inhabit a million worlds with very different natural conditions: from death worlds to the paradise planets. On most of them planetary governors don't have total control and the social conditions in the human empire are just as varied as the natural ones. Many forge worlds utilise mind control and massed slavery, while on many planets even the word "passport" is unknown. On most planets life is indeed very harsh, but it is mostly so because of difficult conditions or a constant threat of war. Lore: As humans of the 3rd millennium, we accept a lot of basic principles without question - principles like people equality, their basic rights to life and freedom. We also believe in progress, we accept that all power comes from the people and in many other principles. But any moral system is just a reflection of the outside conditions and 40k-era humans think very differently. Imperium-era humans, see no inherent value to human life or dignity: life is given meaning and value by it's usefulness to the Emperor. They would only laugh at the problems that we consider important today. Most of the Imperium citizens believe in a great plan, devised by the Emperor, accept their role as a tiny cog in an imperial machine, worship the mighty incomprehensible technology of the lost ages and hate everything alien to them. While in a lot of fantasy settings there isn't a lot in terms of a medieval mentality, 40k does resemble real middle ages in a lot of ways and the mentality of the people of M41 doesn't have much in common with a modern way of thinking. Lore: Low Gothic is a language of imperial spaceships' crews. It has common roots with a lot of planetary dialects, so people, whose dialects are similar, may understand one another. But it is not a language in a way we understand the term - it doesn't have a unified alphabet, for example. Thus, humans from very different worlds may often find that they hardly understand each other, despite the fact that both speak the Low Gothic. Even the much more unified High Gothic has its own pretentious and archaic dialects. 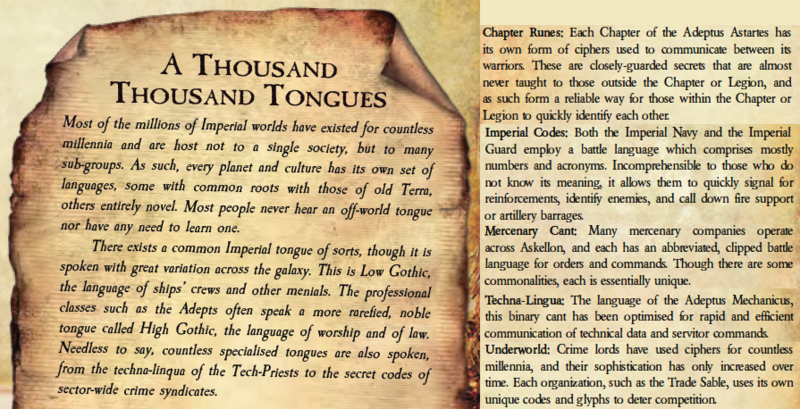 It should also be noted that many imperial planets like Fenris and Tallarn have their own languages, that are completely separate from Gothic. A lot of Adeptus, cults, criminal groups and other closed organisations also have jargons and languages of their own. And even these are not as widespread as it can seem - for example, the famed Lingua Technis is often used alongside other machine tongues like Novabyte and hexamathic code. 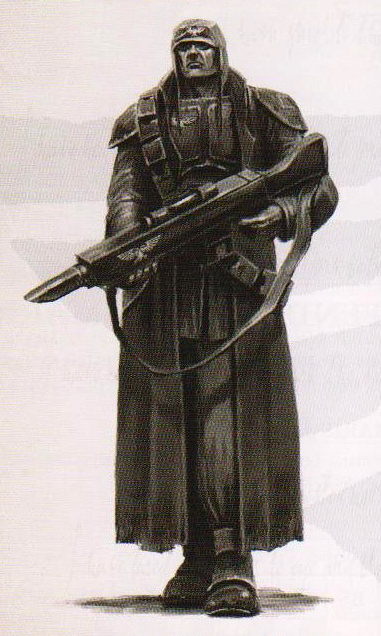 Lore: Despite the presence of Imperium's hierarchal system, most of the Adeptus don't really have clear rules of establishing authority over one another, and in practice, most conflicts between members of different Adeptus are settled by the authority of their representatives and the resources and allies those representatives have at their disposal. For example, inquisitorial conclave can openly threaten a full Astartes chapter of a later founding, while Ultramarines captain may ignore local inquisitors all he wants. Lore: Influence of the Ruinous Powers is an all-permeating one and nobody has real immunity from it. There were traitors among every imperial organisation. Yes, even in your favourite Space Marine chapter. Only known exception to this rule are the Grey Knights. 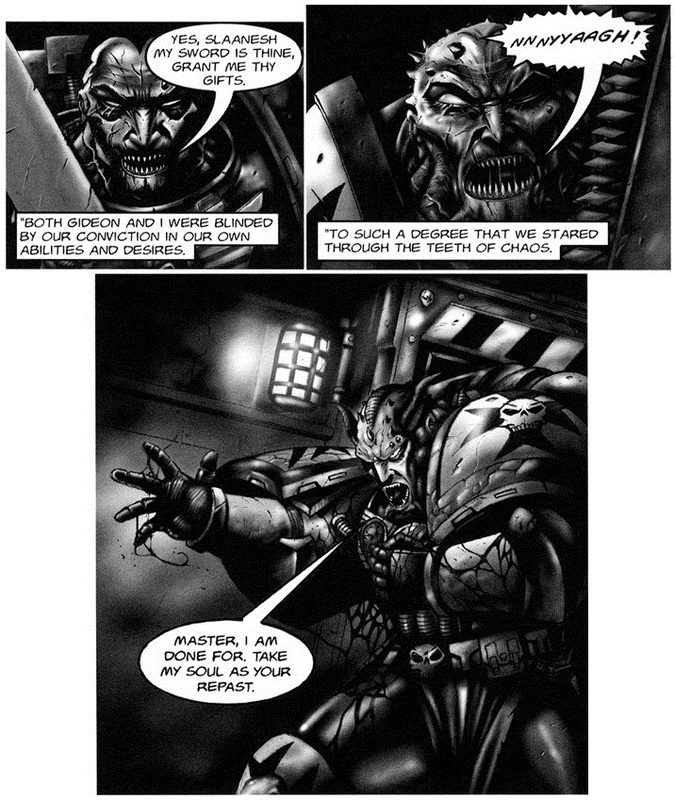 Lore: Disgust and hatred towards xenos is widespread and is encouraged amongst common imperial citizens, and for most of them a thought of seeing, let alone speaking, to one, is abhorrent. However, a lot of high-ranked imperials understand the value of diplomacy, alliances and occasional trade, so the negotiations and temporary alliances in order to achieve shared goals do happen pretty often. There is never a total trust in these meetings, and both sides are likely to keep their weaponry nearby, but in the harsh conditions of the 41st millennium it is often necessary to negotiate in order to survive. 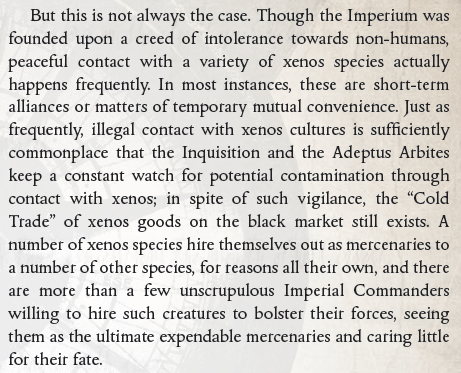 There is even a ritual of xenos sanctification, allowing some of them to visit human worlds with a guardian. So there are the major misconceptions dealt with. In the final part I'll cover myths regarding enemies of the Imperium - xenos races and followers of the Ruinous Powers. Stay tuned, guys.